Playing Time: 45 - 60 min. The board game Hellas is a fight for prestige and power. You and your opponent will be fighting for control over the islands around Hellas. Now, ships and swords will be used to move forward and find out what you could become ruler over. 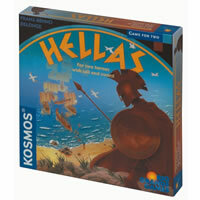 Hellas is a great strategical game for you and another player. Work hard to win the goodwill of the Gods. Hellas will definitely get you involved and thinking of the best way to trump your competitors. Play Hellas today! See the Hellas game rules and instructions. Please keep in mind that the official Hellas board game rules and instructions could be different depending on the game version you have. The rules below are some of the exact directions on how to play Hellas. Share with us your comments, funny stories, tips, advice, strategies, creative ways to play, questions about how to play, problems with the rules or anything you want about Hellas. All submissions will be reviewed within 24 hours. Click here to add your Hellas comments.